Kogi State Governor, Alh. Yahaya Bello has expressed confidence that the performance of President Muhammadu Buhari will guarantee his re-election in 2019, saying the “real voters are behind the President”. Bello stated this in a statement through his Director General of Media and Publicity, Kingsley Fanwo in Lokoja over the weekend. He said the President remains the most popular political figure among the masses of Nigeria. “Two classes determine the electoral success of any candidate in Nigeria. The powerful elites and the masses. In 2015, the masses took over by trooping to the polling units massively to elect Africa’s most popular and most trusted political figure, President Muhammadu Buhari. “Many of us who supported him actually supported his incorruptible and disciplined personality. I founded the Kogi Youth Arise Group with like minds to ensure the victory of the President in Kogi State. President Buhari is a phenomenal leader who truly loves Nigeria. “Almost three years into his first tenure, the President has proven why we elected him in the first place. He has destroyed the roots of corruption which was our number one problem as a nation. He has taken steps to unite the nation by ensuring his style of leadership brings people of diverse cultures and faiths together. “It is not out of place to expect corrupt individuals and protectors of corruption to antagonize the fighters of corruption. Those who could not steal from the national pot anymore are coming out with all sorts of ideas and strategies to stop the man who is determined to continue to move Nigeria forward. “2019 is not about PMB, but about the determination of Nigerians to finally own Nigeria by re-electing a President that has done so much to fight corruption, fight insurgency and develop the nation. Nigerians will surely re-elect President Muhammadu Buhari. “When the President rolled out his achievements, the opponents of his good governance are scampering for cover. President Muhammadu Buhari has surpassed all expectations. In Kogi State, I told my Media Office to give updates on what we have done so far and where we have to be in the next one year. Now the song has changed. “There is a deliberate choice of the opposition to promote falsehood and generate misinformation to rail their ways into power in 2019. Nigerians know better. As Mr President stopped them on the national stage, we also stopped them in Kogi State. Former Governors of the state who didn’t remember to put good roads and electricity anywhere, including their villages now go home to find out a Governor is doing that already. “The people are with us. The people are with the APC and by the grace of God and the powers of the electorate to choose light over darkness, the party shall triumph again in 2019”. Bello said the All Progressives Congress is united ahead of 2019, saying there was no division in the party. “APC is a big family. We are united and prepared to continue to serve Nigeria beyond 2019. PDP helped us to sell Buhari in 2015 and they have started again now. The people know the truth about Buhari and will continue to follow his leadership which protects the poor masses”. 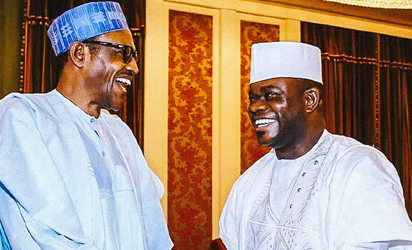 The post Buhari’s track record will guarantee his re-election- Kogi Gov appeared first on Vanguard News.